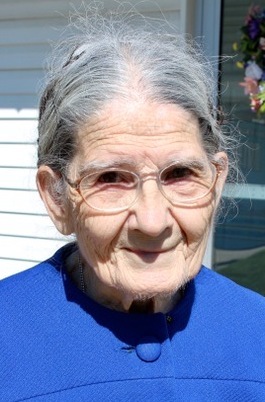 Obituary for Golda June McCracken | Thomas E. Fickinger Funeral Home, Ltd.
Golda J. McCracken, 94, of Portersville, died Friday, April 12, 2019 at Concordia Lutheran Ministries of the Good Samaritan Hospice, Cabot, PA.
Golda was born on March 7, 1925, in Ulysses, the daughter of the late Harry and Eleanor (Mitchell) Woodcock. She was the wife of Arnold McCracken, who preceded her in death on July 11, 2001. Golda attended Robert Wesleyan and Houghton College in New York State where she studied to be a teacher for students with learning disabilities. In 1947 she moved to Oakdale Kentucky. While in Kentucky she meet Arnold McCracken and they married in 1952. In 1964, after 17 years and 7 different homes in Kentucky, her family moved to Portersville, PA where she taught at the Portersville Christian School. She was born and raised in Potter County. She was a member of the Woman's Christian Temperance Union and a life member of the God’s Country Ministries, Coudersport. Golda is survived by two sons and a daughter-in-law, Melvin L. McCracken of Portersville; Wesley R. and Marlene McCracken of Slippery Rock; a daughter and son-in-law, Esther E. and Sam Evans of Ft. Worth, TX; grandchildren, Rodney N. McCracken and his companion Carol and Renee’ A. and her husband Jim McDevitt and a long time special friend, Heidi Moore. In addition to her parents and husband, Golda was preceded in death by a brother, Frank Woodcock. Family and friends are invited to a visitation Friday, April 19, 2019 from 4-7:00 pm at the Thomas E. Fickinger Funeral Home, 210 North East Street, Coudersport, and Saturday from 10-11:00 am at the God’s Country Ministries, 1237 E. 2nd St., Coudersport where the funeral service will follow at 11:00 am with Pastor Peter Tremblay and her grandson, Rodney McCracken, officiating. Burial will follow in the Raymond Corners Cemetery, Allegany Township.